Here’s the deal: if you want to build an online business, you NEED a website. You can’t build your brand online without a website. Think of a blog as another way of saying website. You know you need a website, right? A blog is just an extension of that. It’s a way for you to communicate and provide value to prospective customers. Affiliate links are included below. This means I will receive a commission if you order a product through one of my links. I only recommend products I believe in and use myself. A blog is a great way to share your creative passion with the world. You can literally make money from blogging about something you already love to do. Fall and Winter are popular seasons for blog traffic, the sooner you get started, the sooner people can find you! After the holiday season, many people get bummed out about going back to work in the new year, you can monetize your passion and turn it into a full-time income. Goodbye 9-5! Blogging is super flexible. You can blog while your kids are in school or after they go to bed. There’s no set time you need to show up in the office! You can change your family’s financial situation. Blogging is an outlet for you to express yourself. Blogging helps you learn new skills. Blogging gives you the confidence to share your talents with the world. Hard work pays off in the blogging world. Help people overcome hardships and obstacles in their lives. Gain new connections and friendships in both business and life. It opens a whole new world of opportunities. It breaks you out of your comfort zone. 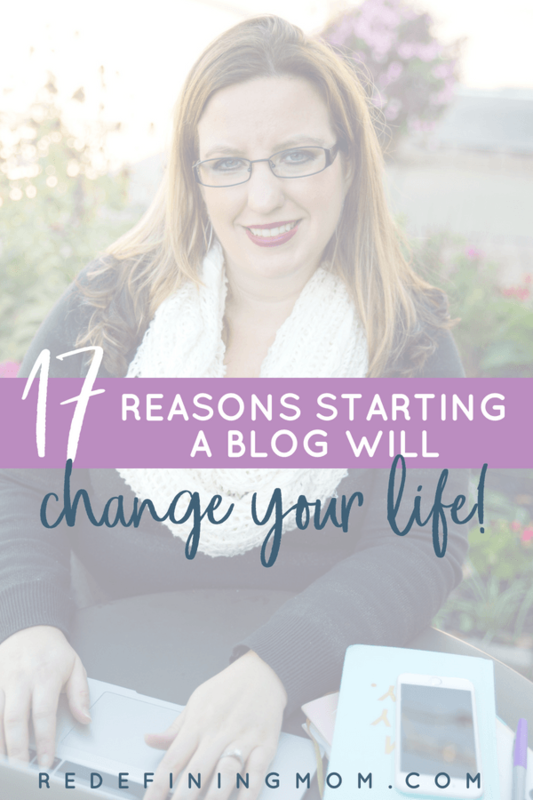 Blogging is the most inexpensive way to start a business that has ever existed. You can blog from anywhere in the world. Good! You should be. Now let’s cover the technical basics of setting up your website. A domain is your website name (also known as a URL). Your domain is what people will type into their browsers to access your website. Mine is https://redefiningmom.com. Before settling on the name for your business, you should always make sure your domain name is available. You can check this for free using Namecheap. I suggest checking all major social media channels to make sure your business name is available before settling on a name. The major ones I would consider: Facebook, Twitter, Instagram, Pinterest, and YouTube. This doesn’t necessarily have to hold you back. I was able to get @redefiningmom in most instances, but on Pinterest I am @redefinemom. DO NOT register your domain name yet. We will discuss whether or not to pay for your domain name through a company like Namecheap or to use your hosting provider to register your domain name later. A website hosting service provides a server that maintains and hosts the files for your website. Every time someone accesses your website by going to your URL, they will be accessing files that sit on the hosting provider’s server. WordPress is a content management system (CMS). It is the backend of your website that you will access to control what people see when they go to your website. Your WordPress install is hosted on your hosting provider’s server. Do I need to have a self-hosted website? YES! A self-hosted website is necessary for having complete control over what you do on your website. A website is yours and it is COPYRIGHTED to you. If you do not self-host, you are giving up control over your most valuable asset. Blogger is a popular blog platform run by Google. What happens if Google decides to stop supporting Blogger tomorrow? The same is true for social media. Growing your platform solely on Pinterest or Facebook puts you at the mercy of their algorithms—and they can shut you down at any time. If you plan on taking your business seriously, a self-hosted website is a necessity, not an option. WordPress is the most popular CMS for running a self-hosted website. If you Google “WordPress,” you will find two different sites: WordPress.org and WordPress.com. WordPress.com is NOT for self-hosted websites. For our purposes, you will be using WordPress.org. A few benefits to using WordPress.org are: it allows you to self-host your website, be in control of your own data, use any WordPress plugin, create custom themes, make money from displaying ads, and track analytics and conversions to your site. What is a parent theme and child theme? I use the Genesis Framework by StudioPress for my parent theme and StudioPress’ Lifestyle Pro theme for my child theme. A basic way of explaining this is that the parent theme is the guts to your computer; it’s not something you touch or modify. The child theme is the operating system where you can add programs and modify functionality. 99.9% of the time, you will never touch your parent theme—but just like you want a powerful computer processor to be able to handle how you use your computer, you want to choose a reliable and powerful framework for your site. The child theme is where you modify the design of your site. Both the parent and child themes are installed in WordPress. Do I need a mobile responsive theme? Absolutely! Google penalizes websites that are not mobile responsive in their search results. The good news is that all StudioPress child themes are now mobile responsive! Here I am going to take you through the steps of setting up your domain (URL), hosting, and WordPress. 99.99% uptime (because who wants their website to be down all the time?!). FREE setup from Siteground’s support team OR FREE migration services if you are moving from another hosting company. SSD drives—which means that their servers operate much faster than a lot of their competitors, keeping your website load times best-in-class. FREE SSL certificate for one year ($82 value)—many hosting providers charge $100+ a year for this feature. Amazing response times from Live Chat agents 24/7 (my favorite feature!). Data centers in the US, Europe, and Asia-Pacific. A NOTE ON CHOOSING A HOSTING PROVIDER: I want to caution you that you get what you pay for. I used another hosting provider for 3 years with only a few issues, but as soon as I started seeing a decent amount of traffic to my site (around 30,000 page views), my site began to crash all the time. Their customer service was very unhelpful and downright rude. If you spend some time researching hosting companies and look beyond the canned recommendations from bloggers who make money via affiliate sales, you will see that their business model is to bring you in low, provide terrible customer service, and then upsell you at a time when you will be most desperate. This happened to me during a spike in traffic when I was in the middle of a product launch. In the spirit of complete honesty, I will tell you that the other hosting provider is Bluehost, and if you decide to go with them, I understand. Please know that as you grow, it will inevitably become a pain point for you. If you purchase Bluehost through my link, I will receive a $65 commission. I do believe that their generous affiliate payout combined with their low cost makes them an attractive option to recommend to bootstrapping new bloggers and business owners. If you purchase through my Siteground link, I will receive a $50 commission if I make 5 sales or less in a given month. I can’t get any more honest than this. The choice is completely yours! My opinions expressed here are based solely on personal experiences with both companies. Now on to showing you how to set up an account with Siteground! I recommend starting with the Grow Big plan, it gives you the perfect amount of room to grow as new blogger/website owner. The great thing about Siteground is that you can seamlessly upgrade as you go, and the upgrading costs are clear. This is an amazing feature to have for Google rankings. Google penalizes websites with slow load times! The Grow Big plan comes with a 30-day money back guarantee! Purchase your domain name directly through Siteground. 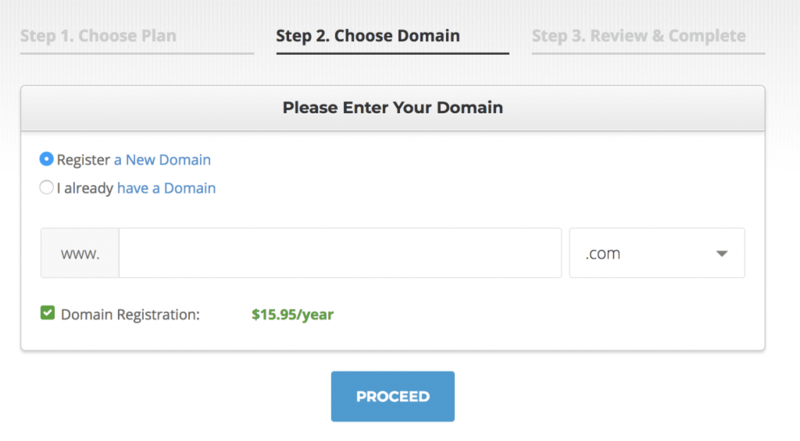 Use a domain name you already own through another provider (you would not pay the additional $15.95/year through Siteground if you choose this option). I register all my domains with Namecheap. Why should I register my domain somewhere else? If you ever have an issue with your hosting company, or if your hosting company gets hacked, it creates a level of security for your domain if you keep it separate. Head on over to Namecheap. Enter the domain name you’d like to register. If the domain name you want is available, add it to your shopping cart. Namecheap offers domains for super cheap so I recommend selecting the maximum number of years available (5 years). I always leave auto-renew turned on. You won’t want to risk someone coming in and claiming your website if you forget to renew! UPDATE: Domain privacy “WhoIsGuard” is now free with all Namecheap domains! PRO TIP: I use the Chrome extension, Honey, to search for discount codes I can use when checking out online. In this case, I saved 20% on my order by using this extension! After you’ve purchased your domain name on Namecheap, you can finish checking out on Siteground. If you choose to buy your domain through Siteground, here’s what your checkout screen will look like. Keep domain privacy selected. I always purchase domain privacy because there is a directory, Who Is, where anyone can look up the personal information provided by a website owner. Since most people use their home address, it is safer to select the privacy option. This will mask the owner of the domain. I prefer to keep SG Site Scanner selected for peace of mind. If you choose to register your domain elsewhere, this is what your checkout screen will look like. After you’re done checking out, you’ll receive a confirmation email from Siteground. You’ll use the credentials you selected during the checkout process to sign into your Siteground account. 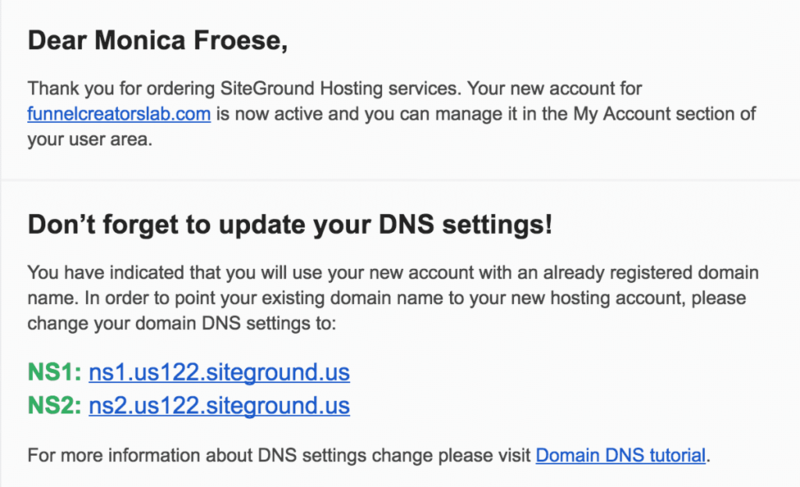 If you purchased your domain separate from Siteground, you’ll receive an email with these instructions. This looks a little scary, but I promise, it’s not! Head back over to Namecheap and navigate to your dashboard. Here you’ll see a list all the domains you’ve purchased. 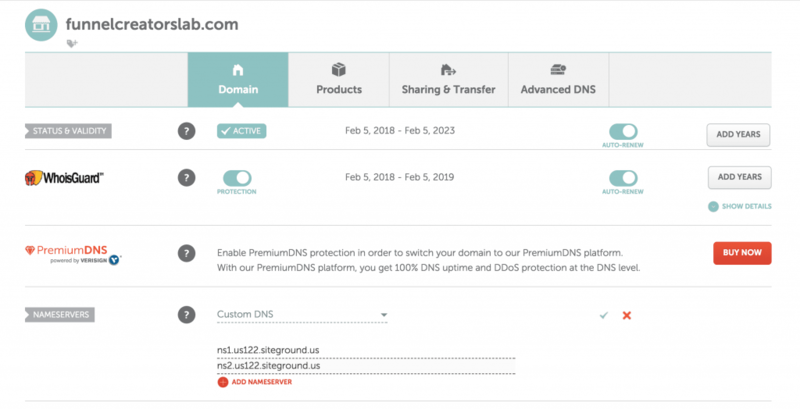 Under “nameservers” select “custom DNS” and copy the DNS records from the email Siteground sent you. Select the blue checkmark to confirm your entries. Within 48 hours, your domain will now point to Siteground’s hosting platform. It usually happens within a few minutes. 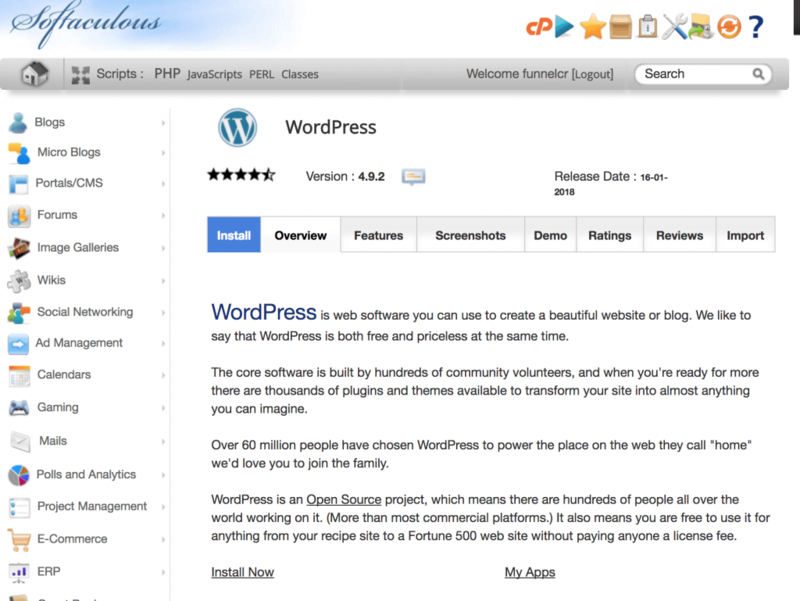 You can continue on to the next step of installing WordPress while you wait. Earlier I mentioned that WordPress is a Content Management System and the backend of your website that you will access to control what people see when they go to your website. Now it’s time to install WordPress on your hosting account through Siteground! PRO TIP: You can ask Siteground’s live support to do this for you! Inside your Siteground account, navigate to your cPanel. Siteground offers free Wildcard SSL certificates! If you’re tech-savvy, you can set this up yourself. If you have any trouble, use SiteGround live support, they are awesome! Once your SSL certificate is set up. Now it’s time to install WordPress. Navigate inside your cPanel to “autointallers” and select WordPress. 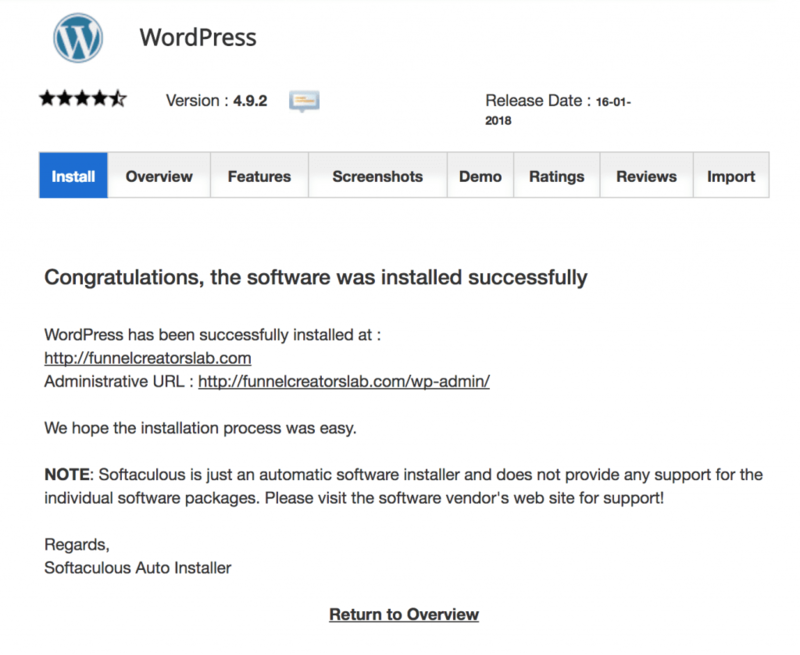 Now it’s time to install WordPress on your site! Congratulations! You’re now ready to access your website’s backend. To access your WordPress panel, you will go to http://yourwebsiteurl.com/wp-admin and enter the credentials that you just set up. After you log in to your WordPress dashboard you will go to: Appearance → Themes → Add New, or activate a pre-installed theme from this page. I use the StudioPress’ Genesis Framework with the Lifestyle Pro child theme (also sold by StudioPress). Genesis is widely recognized as the best framework for building a WordPress website with a ton of free tutorials available on the web to help you properly configure your setup. All StudioPress themes are mobile responsive. As I mentioned earlier, if you do not have a mobile responsive theme, then you will be penalized by Google in search results. When I changed my theme, I used the StudioPress mobile responsive tool to check the mobile responsiveness of my website. Restored 316 also has awesome (and feminine) child themes for Genesis. These are the plugins I recommend that you start with. You can install these after you have installed your theme. Akismet provides spam protection for your blog. BackupBuddy backs up your blog’s database for an extra layer of protection. CommentLuv shares the love with your readers by allowing them to link-back to their most recent blog post in their comments. JetPack offers many features that can be used to enhance your blog. I primarily use the feature that auto-posts my new blog posts on social media. Social Pug adds a section in WordPress below your content that allows you to control the picture and description that preload when someone uses the social share icons on your articles or pages. Wordfence Security protects your site against hackers. Yoast SEO optimizes your website and articles for Search Engine Optimization (SEO); it basically gives your content visibility in Google search results! This is how you will track how well your site is performing. It’s the industry-standard way of monitoring the traffic to your site. Do You Need Professional Email? One thing that I avoided doing for a long time was setting up a professional email. That means instead of using a Gmail or Yahoo! account, you would use yourname@yoururl.com. It is much more professional to do it this way, and it looks much better when reaching out to other businesses. You can set this up for free through your Siteground hosting account and have your email route into your personal (or separate) Gmail account. I did this for a long time, but then I heard that sometimes hosting providers filter emails as SPAM. After doing some investigation, I settled on G Suite . It allows you to use your domain email address and all the Google Apps such as Google Drive and Google Calendar. I highly recommend that you do not filter your email through your hosting provider. The cost is minimal at only $5/user per month. Choose whether or not you will be using an existing domain (you should be using your website) or purchasing a new domain. Create a username and password. For example, my username is monica@redefiningmom.com. In order to verify your domain, you will paste the HTML tag in the same place you put your Google Analytics code. Genesis (requires the Genesis framework to do it this way) → Theme settings → Header scripts → Save settings. After you have updated your MX records, Google will verify that you own the domain, and you can start logging into Google with your username and password! Bonus Tip: Even Google is not perfect. When you store things on the cloud, they can disappear. I strongly recommend backing up your G Suite applications with Spin Backup. Now, How Do I Actually MAKE Money from Blogging? 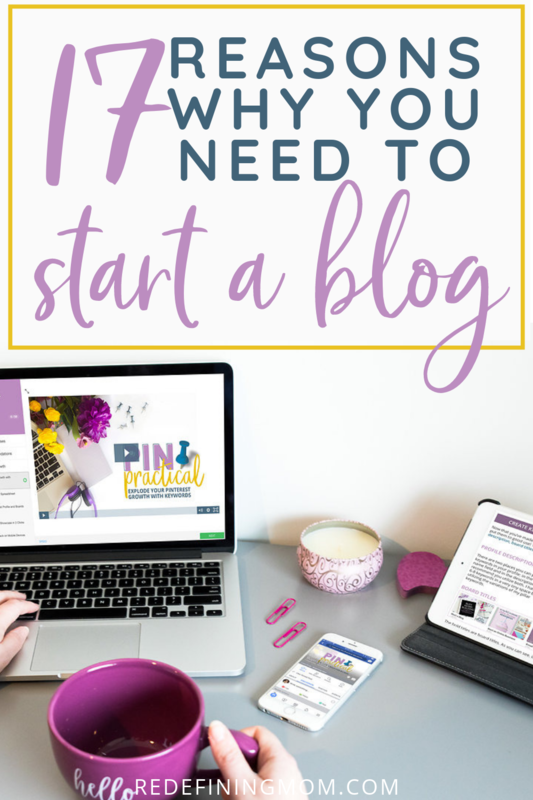 Okay, So NOW You’re Ready to Take Your Blog to the Next Level? 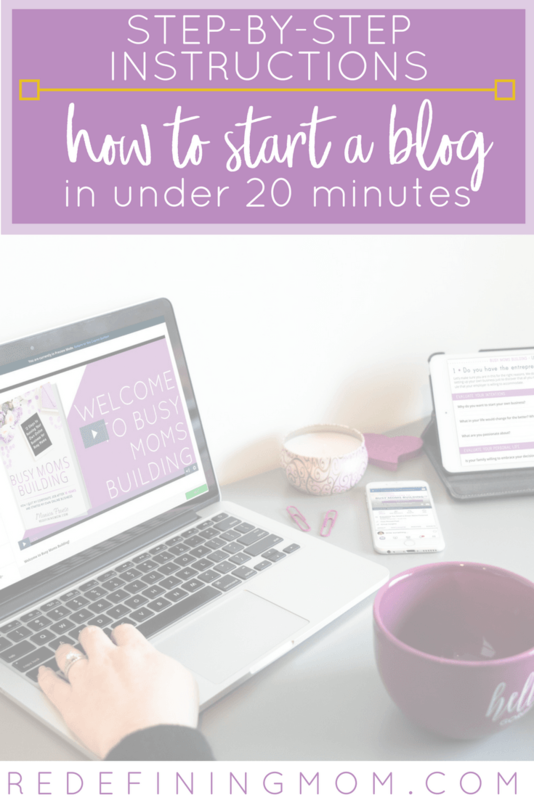 Ultimate Beginners Guide to Blogging: How to Blog for Money<– my 4 step formula for making money online! 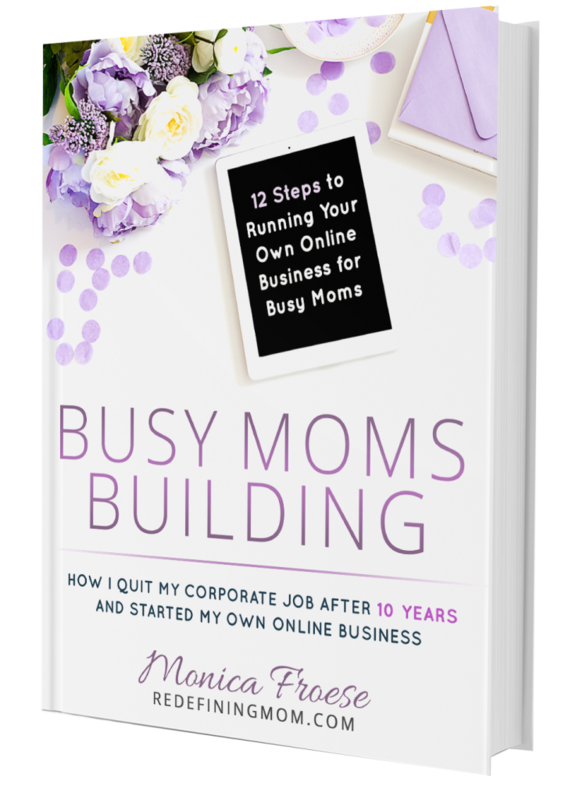 Busy Moms Building is my course for moms who are looking to turn their passion into a profitable business through blogging! In 12 easy to follow steps, you can build your own online business in 45 days. Thank you for your great article! It is so useful.